On Friday the White House released Rep. Devin Nunes' highly controversial memo containing completely unverified claims that the FBI conspired against Trump. Not only is the memo devoid of any hard evidence, it makes dangerous assertions about the FBI and politicizes the non-partisan organization. The FBI even issued a rare statement warning that the memo leaves out key information and is inaccurate. Rep. Devin Nunes is responsible for this sham of a memo and needs to be held accountable. That's why we're hitting back by putting up this bold billboard outside his district office in Visalia, CA and organizing local protests. 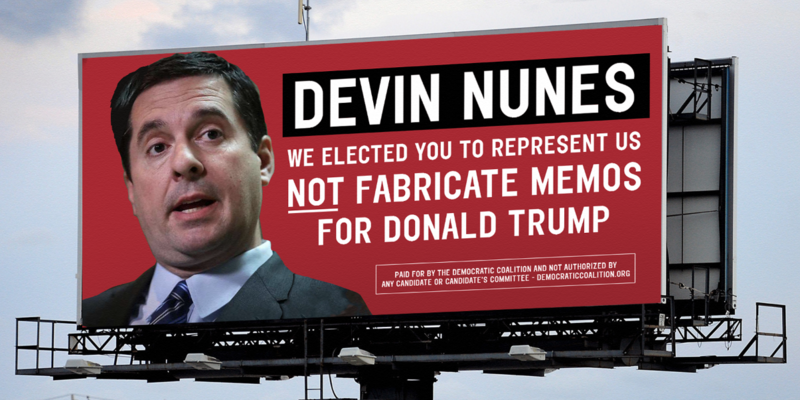 Please help us put this billboard up and hold Nunes accountable by making a donation! And visit www.DemocraticCoalition.org to learn more about the work we do.